In addition to raising money, the Dempsey Challenge brings together bicycle riders and runners, volunteers, cancer survivors and affected families. LEWISTON — Nancy Muir has been volunteering with the Dempsey Center for eight years. Typically, she also walks to support the Dempsey Challenge, but this year, the 77-year-old was sidelined by a knee injury. She’s moving more slowly than usual, you understand. Can’t get around the way she used to. Then Patrick Dempsey appeared on the sidewalk and whoosh! Muir was off like a sprinter. A half-second later, she was giving Dempsey a big old hug and a kiss before the throngs of other admirers could reach him. 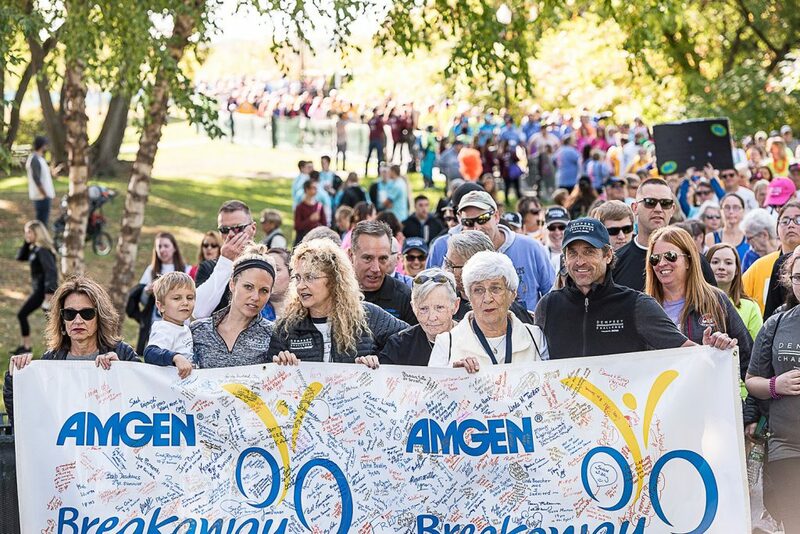 On the Lewiston side of Longley Bridge on Friday afternoon, hundreds turned out to meet Dempsey along with a team of bicycle riders who came all the way up from South Carolina. While the usual mobs of people crowded around Dempsey, 66-year-old Sheila Barnies had other ideas. “I’m going to do something different,” she said, and then marched over to Dempsey’s bodyguard and hugged him instead. It’s OK, though — the bodyguard happens to be her brother. Like so many others who came out to help launch the start of the weekend event, Barnies is a longtime supporter and volunteer with the Dempsey Center. When she started all those years ago, she was as healthy as could be. Then, six years in, she was diagnosed with breast cancer and had to turn to the center for support. Muir has never been diagnosed with cancer, but her son and daughter-in-law were not so fortunate. For eight years she’s been volunteering with the Dempsey Center, she said, as a way of giving back to those who provide so much help to the suffering. The team of riders from South Carolina arrived a minute or two after Dempsey, wheeling into Lewiston to a cacophony of cheers, cow bells and car horns. They had pedaled for 1,300 miles to support the Dempsey Center and now, at last, they were in Lewiston’s Veterans Memorial Park. Thoughts on the long trek? Friday morning started off rainy and cool, Garner said. As they made their way toward Lewiston, the bikers thought they might be in for a long, wet ride in the rain. It was. At about 3 p.m., the clouds parted and the sun came out. The day was bright but not blazing hot as it has been. “It’s so nice to be cool again,” said Linda Garner, Tedd’s mother, who flew up from Savannah, Georgia, to support her son and the Dempsey Center. One of her sons suffers from brain cancer, she said. The South Carolina-based Challenge to Conquer Cancer Riders have been traveling to Lewiston for five years now. This year, according to the riders, the trek was mostly uneventful. There were some difficulties at the beginning, said rider Milton Bowen. On the very first day, one rider was hurt in an accident. And now that they were in Lewiston, Dempsey himself, who created the center in 2008, was there to cheer them on. Spend the rest of the day relaxing, Dempsey advised them. The Challenge starts bright and early Saturday morning. 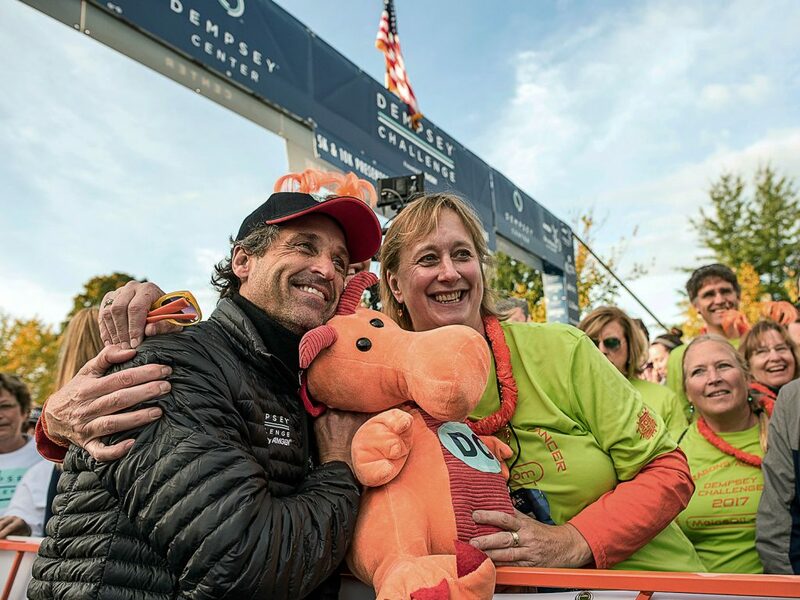 At a news conference Friday afternoon, Challenge organizers announced that more than $1 million dollars had been raised this year for the Dempsey Center. Emily Gardner, with the organization Positive Tracks, said there is something about the Dempsey Challenge that engages people, including the young people with whom the organization works.